All nuts and seeds need to be soaked, sprouted, or fermented in order to get rid of the awesome chemical packages they carry to protect themselves from being eaten before they can sprout and grow. Some of these chemicals are phytates, and phytates can seriously inhibit your body’s ability to keep or use the minerals it takes in. But, you know, it isn’t hard to soak nuts. And they are delicious afterwards. After soaking for from 12-24 hours, I scoop them out and dry them in the dehydrator–which does not take all that long. I put them in a Mason jar and they keep for a long time. Now I have an asset to use as my heart desires. All for less than 10 minutes of real work. These are WALNUTS, which need to be refrigerated, so into the frig they went. Not all nuts need refrigeration. And some nuts, like cashews, need only about 6 hours of soaking–or they get mooshy, would be my guess. For more information on good-food practices, I cannot recommend highly enough getting a copy of NOURISHING TRADITIONS, by Sally Fallon Morell and Dr. Mary Enig, both of The Weston A. Price Foundation. 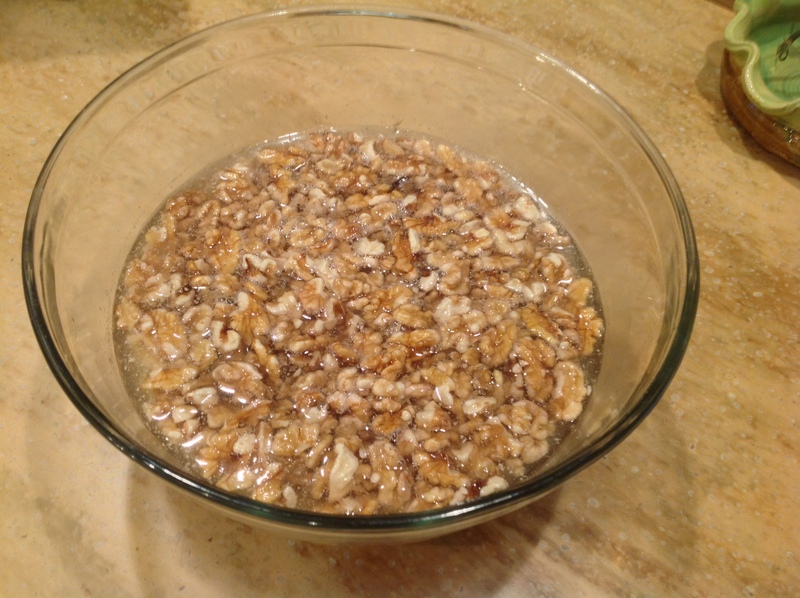 Thanks Louisa – I knew about soaking grains but didn’t know you should soak nuts too – thanks! Does it apply to peanuts or are they a legume? Hi Patricia! All legumes need to be soaked as well. They, too, carry chemicals that need to be soaked to defang them. And soaking makes them more digestible.